After a long, but necessary, hiatus I’m taking back my Template Project: Classics. Hope people are still interested in it. We’ve already seen how to make a kick axx Old Fashioned and how to put little twists to it, changing and matching spirits,sugar and bitters. 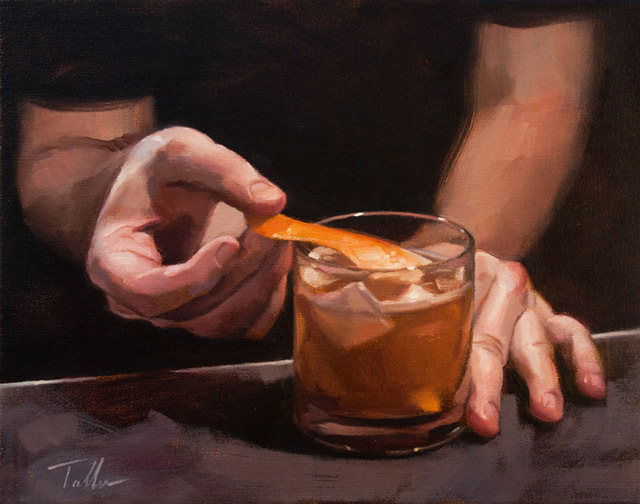 The third part of every classic studied will be the breaking point where based upon the classic I’ll build observations to where the cocktail concept in case can be stretched to. I’d like to first mention that although the Mint Julep and the Old-Fashioned Kentucky Whiskey Toddy are more simple versions of the Old Fashioned I don’t want to take this direction of thinking basically because there is no bitters in those cocktails. Being a spirit driven cocktail the OF is meant to enhance the best in a spirit and brand. The reason that the OF Cocktails is called like so is because of the Fancy Cocktail. A simple description a Fancy Cocktail is an OF + some nice accents, usually maraschino, absinthe or curaçao. Stir & strain into an ice filled bucket, garnish with an orange peel and pineapple. It might not seem very different from the other post, but the addition of the Maraschino and the anise-forward bitter+liqueur combo are the perfect compliment to the fruity and malty whisky, and why not follow that line into the garnish as well? The next cocktail, even though a classic of its own is a nice inspiration to change the OF game. Stir & strain into an ice filled bucket, garnish with a lemon peel and a cinnamon stick. Simply by adding a little complimentary juice the OF get some smoothness that makes it much more easy on the unaware palate. Besides going well with the baked spices notes on the bitters and the vanilla and fruity notes on the rum. Apple juice won’t go wrong with any spirit, but you can try to match flavor+texture of other fruits with a spirit. Banana nectar + Cachaça anyone? See you soon, in the last post about the Old Fashioned cocktail!